Local partner participants celebrate their accomplishments at Land Tenure Project’s closing workshop in Nay Pyi Taw. 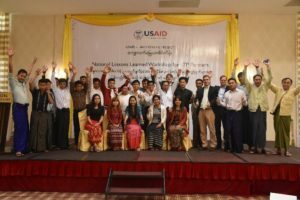 As activities for USAID’s Land Tenure Project (LTP) drew to a close, the project hosted a series of regional workshops to bring stakeholders together to reflect on their experiences in participatory mapping pilot activities and land legal awareness training. Meeting in Kalay, Sagaing Region; Pathein, Ayeyarwady Region; and, Taungyi, Shan State, LTP invited community members, government authorities, and locally led civil society organizations to share lessons learned from the year-long pilot activities. Participants reported on the linkages between mapping activities and their increased understanding of land tenure issues. They identified benefits associated with community-led land resource documentation, and the dialogue that was opened between government and community stakeholders surrounding land concerns. Historically, mapping activities in Burma have been government-led and have employed opaque, top-down approaches, which do not take into account community perspectives or realities on the ground. As stakeholder meetings have reported, lessons learned from LTP pilot programs demonstrate potential for a shift from past land documentation processes. In place of outdated processes, communities are ready to advocate for participatory, bottom-up approaches that help local authorities become well-informed, true service providers in land and resource management.